This unique force-on-force scenario drill inspired him to design HIGH GEAR. This new gear revolutionized scenario training. The helmet design allowed role-players to speak clearly. The streamline, ergonomic design allowed role-players to move naturally - just like in real-life. Only in High Gear could training partners behave like real adversaries in a real confrontation. 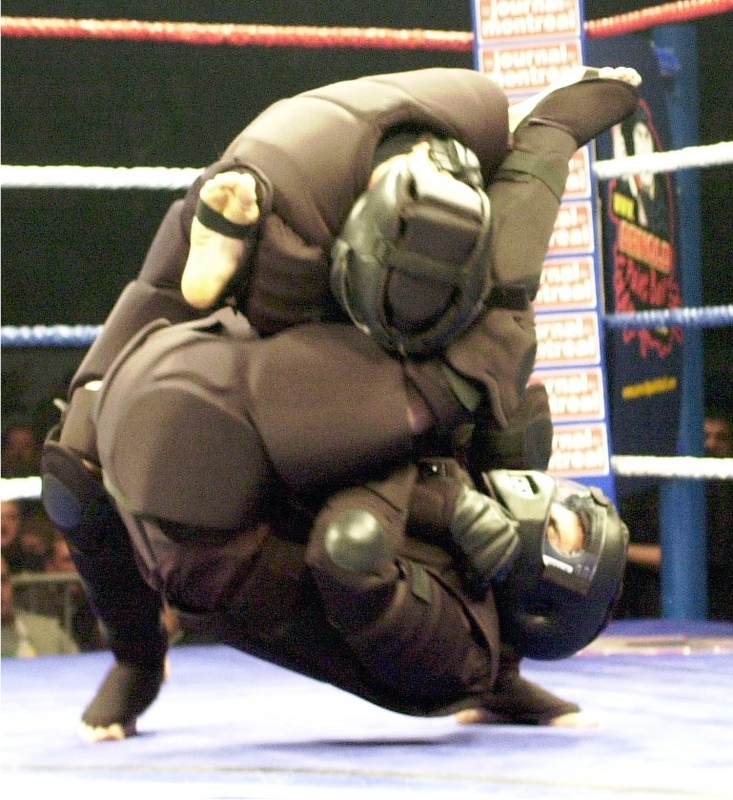 The High gear suit allowed combat athletes to move fluidly so their art or style could be tested while wearing gear. We built it around the role-player’s movement requirements. We wanted the bad-guy to be able to replicate an actual attack in real environments. 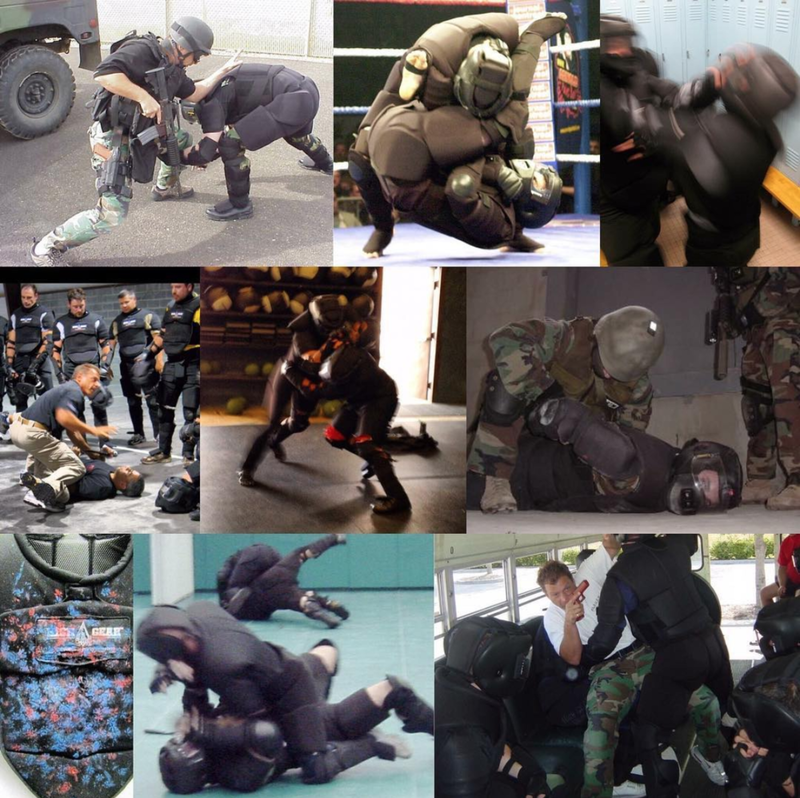 HIGH GEAR helps people understand the chaos of close quarter combatives and force-on-force training. This helps them stress-inoculate much faster than conventional training. High Gear training provides a ‘hack’, a fast-track to developing more competence, confidence and a deep understanding of what works and what doesn’t in a real confrontation. It helps both role-players understand violence in a more visceral way. This helps them learn to manage fear and stay focused on tactics that worked under pressure. I'm Convinced Take Me To The Store! If your scenario gear is too bulky, it eliminates the ‘fear’ of impact. You need this to really develop the proper mind-set. If your gear is too thick, it offers too much protection and you know that the gear will protect you. Again, this changes how you think and move. My thought process is that to learn to protect yourself you must respect the danger. You will not be wearing a padded suit in a real confrontation! With this in mind I spent 5-years (yes 5!) designing this suit. I tested various foams and plastics until I found the right styles, thickness and configuration so that the gear transferred impact but also dispersed it. The result was a suit that let you know when you screwed up! What differentiates us from other padded assailant suits is our philosophy of design that inspired an OPFOR/role-player suit that DOES NOT inhibit or restrict the movement of the role-player, trainer or the student who must practice skills often dictated by ROE's, plans or a use of force continuum. High Gear is the grappling mat you wear! on a concrete floor would you? Now you can practice in any environment. 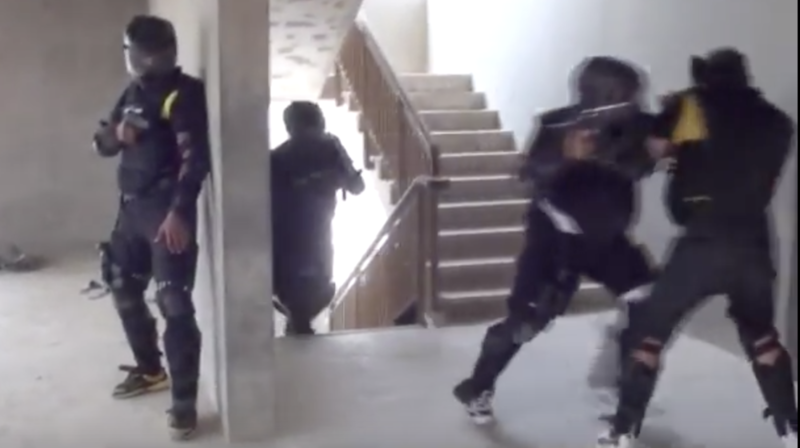 This compilation shows actual training over the years from personal defense to force-on-force CQB/SWAT scenarios. It's important to note how natural and realistic the movement is. This is a critical aspect of our role-player training taught to graduates of our Ballistic Micro-Fight System. Click the image it should load your email program. If not, contact us directly by clicking here. Coach Blauer developed a system called “The Ballistic Micro-Fight” (BMF) is an evidence-based scenario training protocol that reverse engineers confrontations so that the practitioner develops a deeper understanding of how the human body moves during sudden aggression. The formula for this method has been integrated into the highest levels of the military and law enforcement communities. If you would like to host a scenario course or get certified to run scenario-based training using the Blauer system keep reading. A BMF session will work on internal and external awareness, stamina and endurance specific to self-defense and combatives. it will also develop the moral, ethical and legal aspects of confrontation management. Any combat athlete can improve their striking, and protect their partners. World-renowned MMA star, Frank Mir working on isolation drills with Coach Blauer before his fight with Nogueria. 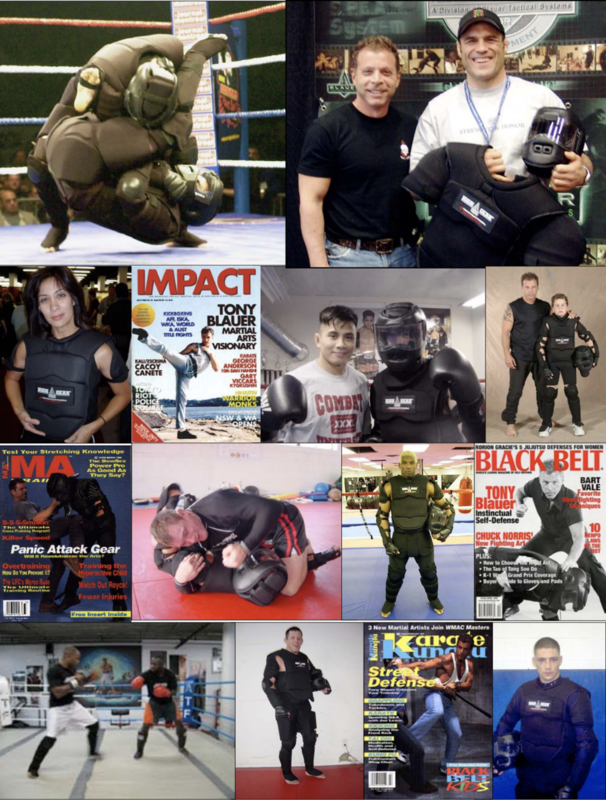 Even though High Gear was originally designed for scenario-based training for police, military and self-defense, it has found its way into MMA and has been used by many of the world’s top trainers. Below is a video from the vault (circa 1995). You’ve got to watch it! It's got amazing footage of military training, defensive tactics, kids anti-abduction training, all showing real movement, live-action and real contact. Check it out, it'll really show you how versatile High Gear really is. ok, how fast can I get my gear? We offer train-the-trainer certifications in our scientific approach to scenario training. Now any trainer/coach/instructor from any style or method can learn to reverse engineer confrontations and intelligently practice, test, experiment their movement, strategies and tactics with greater safety. If you would like to speak to one of our team to discuss how you can host a seminar or get certified, fill out this form. If you have questions about High Gear, please include them in your message. We offer two types of gear, the ORIGINAL suit for DT, combatives, and hand-to-hand training and the Marking Cartridge for force-on-force with UTM and other marking cartridge projectiles.